Scientists investigating the geophysical and hydrological conditions beneath the Greenland ice sheet say their analysis will be vital for helping understand how the ice sheet will respond to climate change. Researchers from the University of Bristol, who have carried out extensive fieldwork in Greenland over the past few years, are to lead a series of new experiments, which could yield important information about the wider risks to global sea levels. Members of the Bristol Glaciology Centre and colleagues from the University’s Faculty of Engineering will work with partners from the universities of Aberystwyth, Cambridge, Edinburgh, Texas, Woods Hole Oceanographic Institution, NASA-Jet Propulsion Laboratory and the Greenland Geological Survey to collate new geophysical data in two complementary projects, the first using ground-based tracers and the second, a suite of airborne observations. The Bristol-led tracers project will reveal how meltwater generated on the surface of the ice sheet is routed at its base. They will work alongside colleagues from the universities of Edinburgh and Aberystwyth, to tackle the challenging task of tracing water flow over 100 km and in sub-surface rivers with double the discharge of the River Thames. The huge volumes of water generated on the surface of the Greenland Ice Sheet makes it challenging to detect any artificial tracers injected in the water exported as runoff. The airborne geophysics project, lead by the University of Cambridge, will focus on ten major outlet glaciers across the ice sheet and will use radar, gravity and magnetic data to characterize the subglacial environment of the glaciers and, in particular, the presence of water and sediment at the bed. “Together these two projects will provide important insights and new information on the factors that control basal processes and motion beneath the 1-3 km thickness of ice that covers most of Greenland,” said Prof Jonathan Bamber from Bristol. Greenland’s ice sheet extends across 1.7 million km2 and contains enough water to cause a global sea level rise of seven metres. The ice sheet is divided into a series of major drainage basins, each typically about 50-100,000 km2 in area. Many of these basins drain into coastal fjord systems via relatively narrow and heavily crevassed outlet glaciers that dissect the mountains fringing the island. Over the past 15 years, rising temperatures have led to increasing mass loss from the ice sheet and subsequent increase in global sea level. This increased loss has been due to a roughly equal increase in the speed of glaciers flowing into the ocean and increased melting at the surface. Results from the new studies will enable the team of researchers to describe essential information about the internal structure of the ice sheet and the conditions at the bed, including basal melting and the routing of basal water. 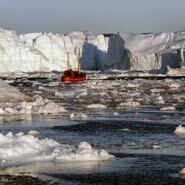 That information will make a fundamental contribution to computer modelling of the ice sheet, and how it may respond to changes in air and ocean temperature over the coming decades.